Ten years ago a holiday abroad was a permanent fixture in the summer calendar for most Brits, with millions flocking to the med and beyond in search of sun, sea and sand. The emergence of cheap foreign holiday packages and a rise in the average wage during the 1960s created an appetite for foreign holidays among traditionally less wealthy Brits who abandoned established home holiday destinations such as Blackpool, Rhyl and Skegness in their droves. However, following a period of economic instability and the rising cost of going abroad people are now opting to stay in the UK to take holidays and this is breathing new life into our once forgotten seaside resorts. At the heart of a classic British seaside resort usually lays a pleasure pier extending out into the sea offering visitors unrestricted views of the ocean. In the 19th Century pleasure piers were architectural wonders that Victorian holiday makers flocked to see. Sadly the latter part of the 20th Century saw many of them fall into disrepair, most notably the West Pier in Brighton that was eventually destroyed by fire in 2003 and was lost altogether. But, those pleasure piers that still remain are once again becoming central attractions at British seaside resorts and many have undergone restoration programmes that have incorporated modern architectural principles into their classic Victorian design. Southport pleasure pier, originally constructed in 1860 is one of the longest piers in the country and has benefited from a modern makeover that has helped resurrect the town’s popularity amongst stay-at-home tourists. What really makes it stand out is the glass observation point located at the bottom of the pier that grants visitors unrestricted views of the Irish Sea and Ribble coast. This is a fine example of how modern glass technology can be incorporated into an older structure without disrupting its classical features. A similar renovation, but on a much larger scale, has recently happened on the South West coast in Weston-super- Mare. 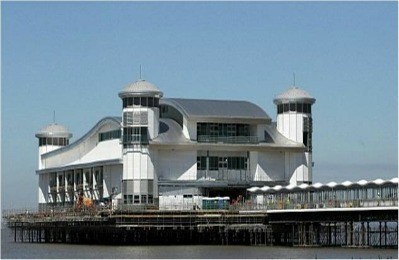 Following a fire in 2008 that destroyed the old pavilion, £36m was invested in reinstating the pier as the resort’s central attraction. The new pavilion building has many modern features including a curved, sloping roof and four towers glazed with curved glass panels. 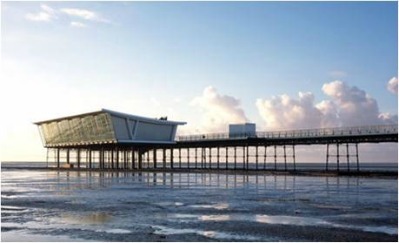 The newly refurbished pier impressed so much that it was nominated by the National Pier Society as ‘Pier of the Year’ for 2011. A common feature in the modern renovation of pleasure piers is the generous use of glass. This can be attributed to the fact that glass allows for people to enjoy views of the sea and English coast from pier pavilions in all weathers. In addition, glass production methods have changed so much since the heyday of pier construction that pavilion buildings can now benefit from new technologies that were not available 100 year ago. For example, improvements in glass production methods like the Pilkington float line in the 1950s or more recent developments such as Pilkington energy-efficient products that combine solar and thermal efficiency plus the latest fire-resistant products allow architects to upgrade older structures, like Victorian piers, with more efficient materials to the benefit of visitors. So, the next time you visit a seaside town be sure to take a closer look at the pier and its pavilion buildings and it will become clear how glass has improved your visit to the seaside, especially when it comes to looking out on to the sea from the vantage point of a pier pavilion.